With fall in full swing and winter just around the corner, I have started cooking with all of my favorite seasonal ingredients. Dried cranberries are a pantry staple of mine and can be used in so many different dishes. 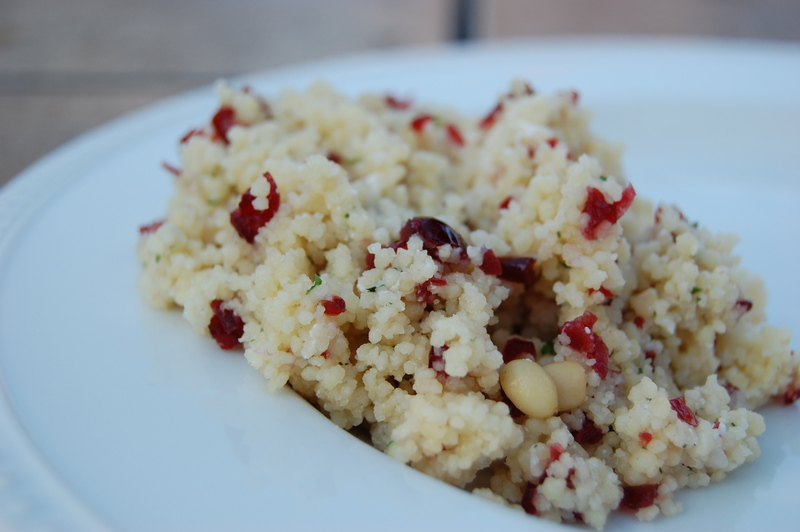 This couscous recipe is a simple way to give your everyday couscous a little more flavor. Make couscous according to package directions. Fluff with fork and mix in chopped cranberries, pine nuts and goat cheese. Serve warm. This couscous recipe is great served along side roast chicken, on top of fresh baby spinach or simply by itself. This just screams sweet and savory…which I love! Great idea! This looks so simple, yet SOOO good!! I’ve made that brand of couscous before, but never thought about putting those delicious ingredients in them. I’m going to try it tonight. Thanks! !